Forever Lantern | Aebersold Florist - Dial 812-945-2544 :: Lanterns - An elegant keepsake, expertly crafted. 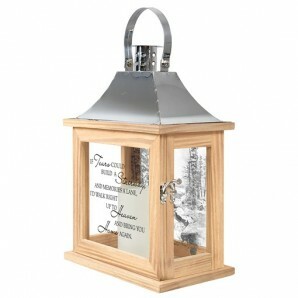 This elegant lantern with LED candle is made of metal with a rustic finish. Perfect to be displayed by hang it up or siting on a table. Add beautiful fresh flowers, silk or plants to accent this lovely gift. Our Indoor/Outdoor Light The Way Lanterns feature a new hexagonal design with the same LED candle and automatic timer, 6 hours ON/18 hours OFF. Requires 3 AAA batteries (included). They are suitable for hanging or freestanding use. Recommended as an accent in floral arrangements. Measurements: W: 9.5" H: 16" D: 9.5"
"Yesterday in our arms, Today in our memories, Forever in our hearts"